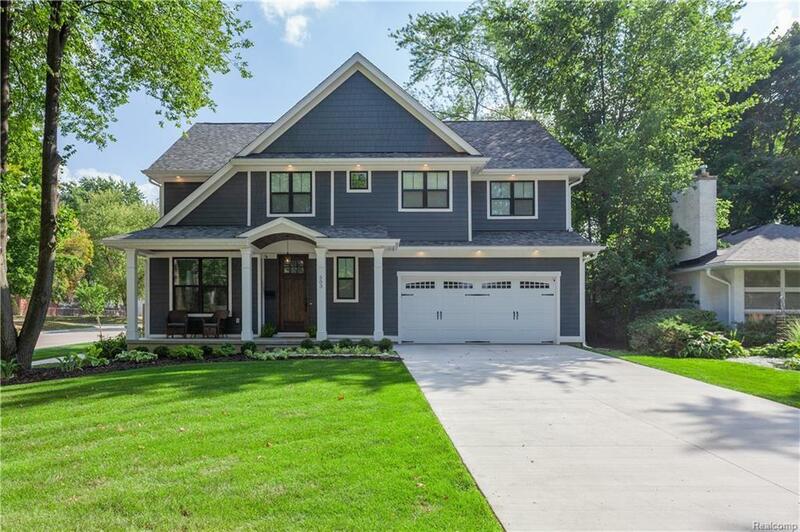 NEWLY BUILT in 2017, Welcome to a beautifully finished corner-lot, custom colonial across the street from one of Royal Oak's most charming spacious parks and just a short walk away from NORTHWOOD ELEMENTARY. Enter into a wide foyer with hardwood floor and 9 foot ceilings throughout the contemporary, Open Floor-plan. Modern light Granite Kitchen fully equipped with stainless steel appliances, including WOLF RANGE, open to dining area and the home's warm and comfortable great room with artisan woodwork matching the wainscoting of the entry level office with french doors. Four bedrooms upstairs all with solid doors include tray ceiling Master Suite with a giant walk-in closet, and dual sink Master Bathroom with private toilet room, separate soaking tub, and Euro-glass door shower. UPSTAIRS LAUNDRY. All the finest fixtures and hardware. Outside, take in the peaceful sights & sounds from a covered porch and entertaining guests on an aggregate patio contained in a private fenced in backyard.